Do you ever wish you could Eat Out In? The idea of not cooking, not leaving home and having a fantastic meal delivered to my door, I’m in! Eat Out In is a unique meal delivery and catering service working with Austin and San Antonio’s most popular local restaurants. The Locally Woman-Owned & Operated service has made it easy to have meals delivered to your door. Eat Out In has been Serving Austin since 1986 and has made it to the Alamo city. I had the opportunity to give the delivery service a go. We went to visit my parents for the afternoon last weekend and no one could decide on where to eat. With the kids ready for an afternoon nap and the adults wanting a little dining experience, it was the perfect opportunity to use Eat Out In. I jumped on the Eat Out In website and simply browsed the menus to local participating restaurants from the site. The Eat Out In site, makes it simple to order your meal online and pay. We decided on P.F. Changs and ordered tons of food, (maybe too much) within 5 minutes of placing the order online, I received a phone call verifying my placed order and that my food would arrive in an hour. We timed the wait and at 51 minutes had the delivery at our door. Once we where mid-way through our meal we noticed a side of noodles was missing from one of our dishes. I immediately called Eat Out In, who appologized and told me they would call me right back. The manager on duty called me within a few minutes telling me the delivery guy was going to have our side order and a dessert delivered to us ASAP. 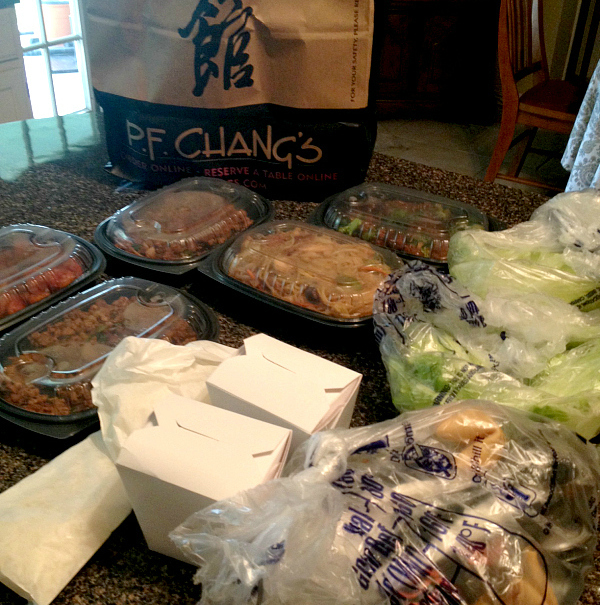 We honestly ordered so much food that we didn’t need the side dish. The manager went on to offer us a refund for the dish and a credit back to Eat Out In for our trouble. I must say this was amazing customer service. That following Monday morning, I received a call from the Austin location, following up on the issue and making sure we where taken care of. This was just the extra effort you don’t see from companies these days. They went above and beyond and made the experience better than I would have expected. So now that I told you all about it, enter to win a gift certificate. When your done go enter to WIN tickets to SA Beer Fest happening in San Antonio this month.